Last week Tech North released the Digital Powerhouse report, in conjunction with the RSA and Impact Hub. 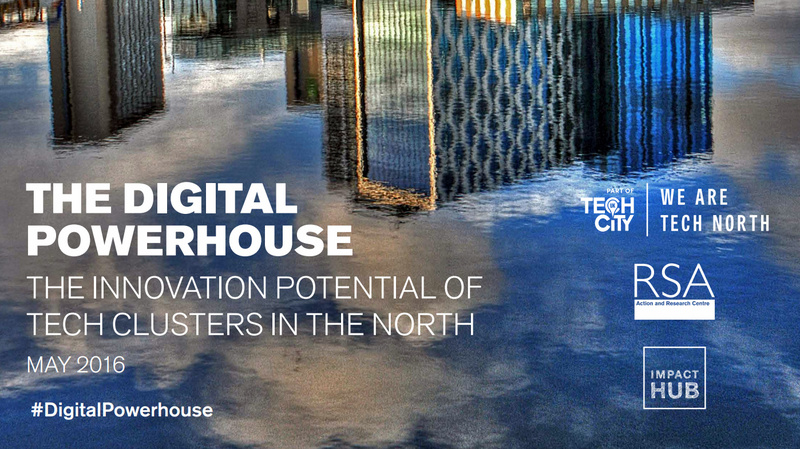 This report essentially lays out the credentials of the northern English technology clusters and makes the case for a number of recommendations to boost the tech industry in the North. As you’d expect, most of the data in the report comes from the Tech Nation report, which I’ve previously blogged about here and here, with additional qualitative data provided from stakeholder workshops conducted by the RSA and Impact Hub. £9.9bn GVA (Gross Value Added), which is 5.2% of total GVA for the region. 283,500 jobs, which is roughly 5% of the total for the region, and 18% of the UK’s total tech workforce. Job growth of 28% over the last 5 years, compared with 3.1% growth in the rest of the region’s workforce. Productivity growth of 11.3% over the last 5 years, compared with 2.5% for the rest of the region’s economy. This has resulted in the region’s tech workforce now being 53% more productive than non-tech workforce. Tech workers in the region are paid on average 60% more than non-tech workers, with average wages for the sector ranging from £37,258 in Hull to £47,959 in Leeds (Sheffield comes in at £42,058). The introduction of vouchers should be considered as a way of allowing businesses to get a taste of what tech could do for their operations. A portal could be created that collates private and public sector contracts in one place, establishing a Northern hub of commercial opportunities. Tech co-operatives should be promoted in the North as a means of helping tech firms band together and achieve economies of scale. Northern tech groups, together with Tech North, should consider identifying corporates that may be interested in backing tech startup accelerators. Northern tech clusters should look at ways they could be proving grounds for experimental technologies (e.g. the use of robotics in social care or blockchain technology in the welfare system). Public service teams should consider organising events with nearby tech communities in order to share procurement knowledge and better understand local needs and strengths. Public sector commissioners should consider the benefits of problem-based procurement, which does not define solutions from the outset. Local authorities and public services should consider releasing their data on procurement history and key performance indicators (KPIs), so as to help tech communities understand the opportunities available. Northern entrepreneurs should consider creating a social enterprise to link public sector buyers with tech businesses in the region, providing a sustainable solution to matchmaking. Partners in the North should champion the use of open source software to enable collaborative innovation, opening software markets up to more local competition. The region’s 600 very large businesses could be encouraged to pledge to do more to support their local tech community. A Founder of Founders award could be given to business owners who do the most to support their fellow entrepreneurs. The outreach teams of Northern universities should consider joining forces to present a single unified offer to local tech businesses. A ‘what works’ review could be undertaken to better understand how the region’s business support offer might be improved for tech businesses. 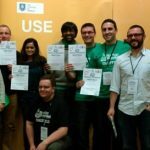 It would be great to hear from people in Sheffield’s tech community whether these policy recommendations resonate, and what else people think should be done to drive the sector forwards. Hit us up with your opinions on Twitter, Slack or in the comments section below. Finally, it’s also worth noting that the introductory vision statement of the report mentions that several of the North’s tech clusters are becoming identified with certain specialisms, including Sheffield as the ‘maker city’, alongside Liverpool (sensors) and Leeds (data). This is an important concept to bear in mind and for us to explore, as ‘making’ means different things to different people, but it does allow us to align our digital economy with advanced manufacturing and engineering on one side; ‘creativity’ including arts, crafts, and lightweight fabrication or another; and electronics, IoT, open source hardware and connected devices on yet another. This identity by no means covers all that is produced in the tech sector in our neck of the woods, but if that’s how the world is starting to see us, my feeling is that we should embrace it and feed in to that narrative. The report also namechecks several leading Sheffield and Rotherham based organisations, including Linktagger, Pimoroni, The Floow, Switchstance, PIP Payments, UK Logistics Hub and the Sheffield Smart Lab, (as well as Sheffield Digital, obvs. ).